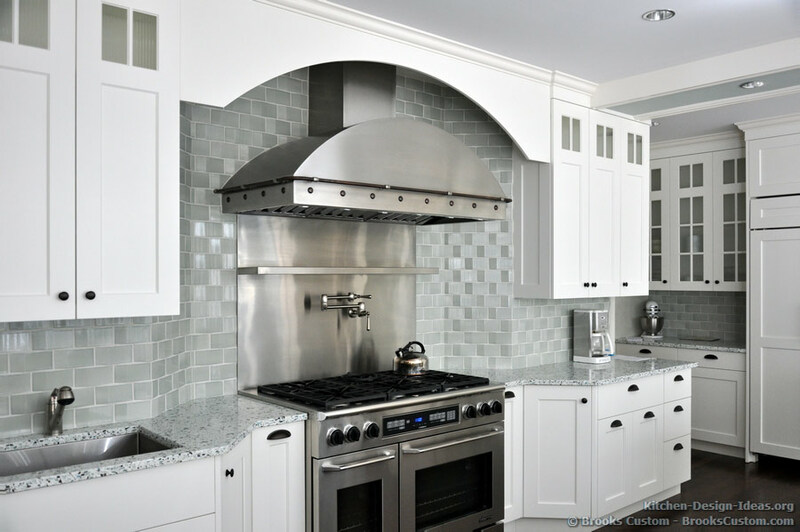 Enjoy this beautiful gallery of kitchens and countertops by Brooks Custom, a renowned manufacturer of high-end custom countertops, range hoods, backsplashes, and sinks. This luxurious white kitchen features a custom range hood tucked under an arched valence along with a pale green subway tile backsplash and a terrazzo countertop. Another luxury white kitchen with a solid walnut wood island countertop, industrial style pendant lights, and luxury inset glass cabinets in the background. This modern kitchen features a combination stainless steel and butcher block countertop on the island, along with stainless steel drawer fronts and a side panel that continues the steel countertop down to the floor. This professional chef-worthy kitchen boasts an all-stainless steel backsplash with a convenient hanging rod for utensils next to a professional faucet and secondary prep sink, all under an open wood shelf above. 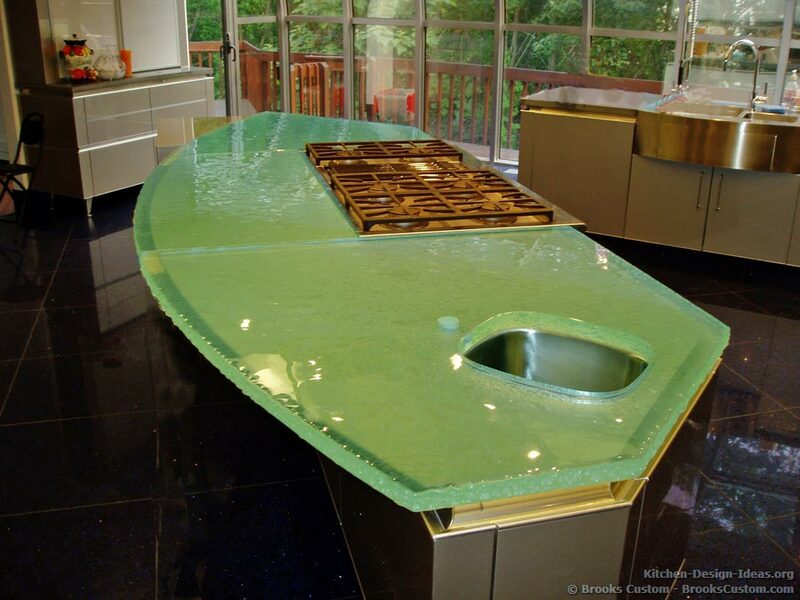 Making a bold splash atop a contemporary kitchen island, this thick glass countertop has a soft wavy texture and blue-green color that really lights up the room. 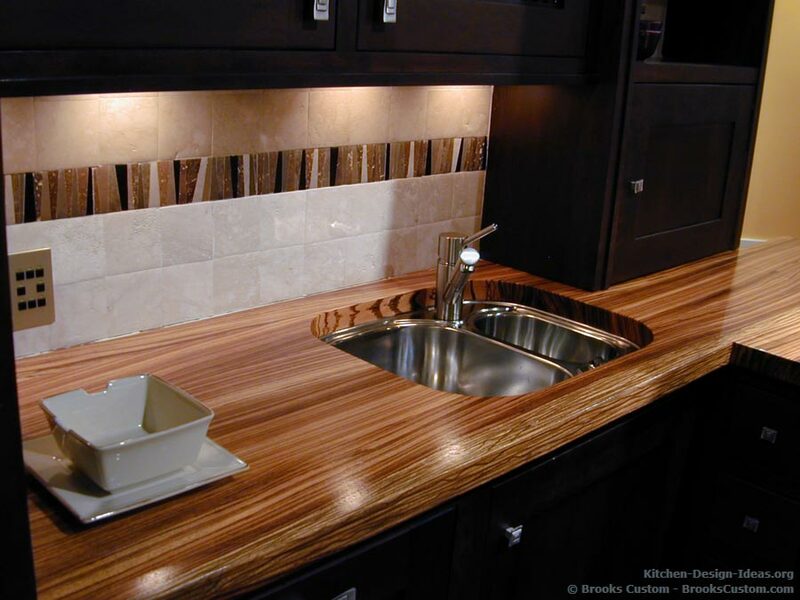 This solid zebrawood kitchen countertop contrasts with a light travertine backsplash and dark shaker espresso cabinets. Type of Business: Manufacturer | Custom Countertops (Wood, Glass, Metal), Range Hoods, Backsplashes, Sinks, and Cabinets. 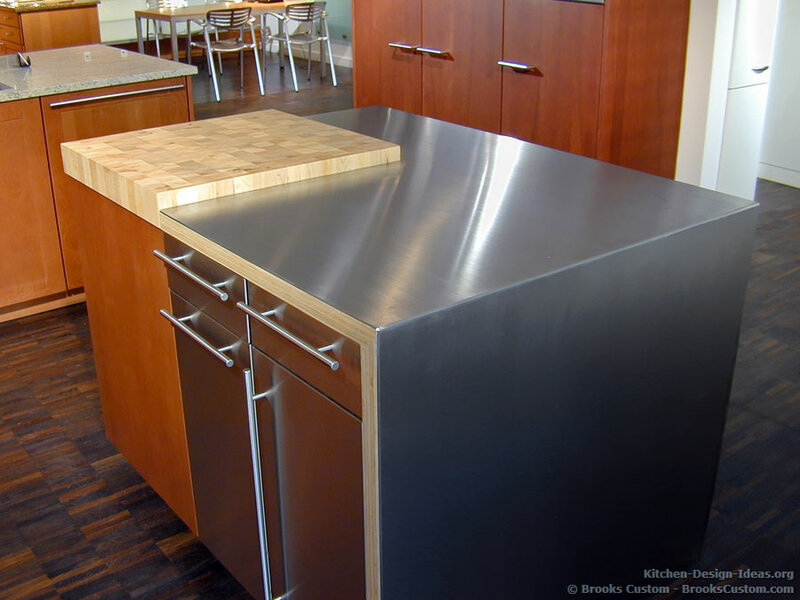 Company Profile: For over 30 years, the folks at this manufacturing company have been working hand in hand with designers, architects, builders, contractors and homeowners to build top quality kitchen components. 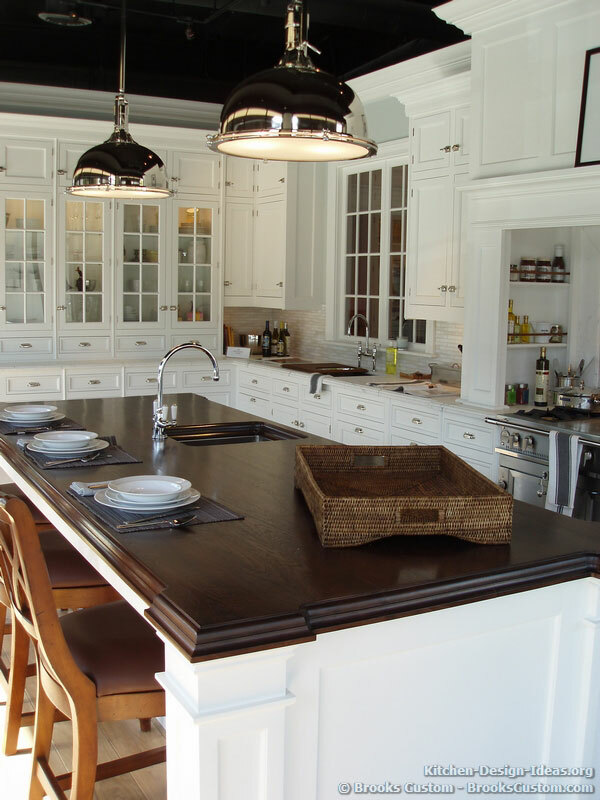 The company specializes in creating high-end custom countertops in a wide variety of materials, including various wood species, glass, and metal countertops. 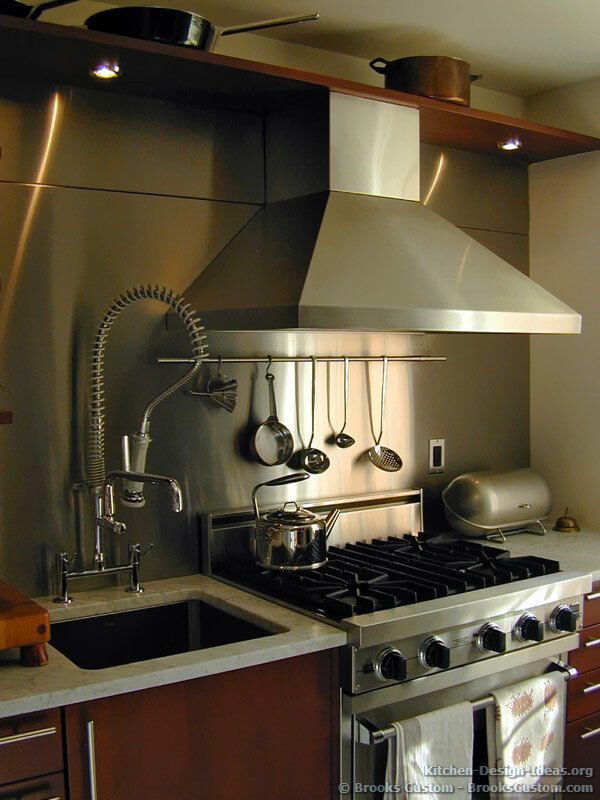 They also build high-quality custom range hoods, backsplashes, sinks and custom cabinetry furniture to order. Everything is made in their local shop, and they ship nation-wide in the United States (contact them for the possibility of shipping abroad if you live outside the USA).